You're a madman. In a good way. How the-? Is spotlighting voxels still a thing? Cuz this is 200% spotlight material right here O_o Huge voxel, clear details, animated wheels, no overlapping issues, mostly handmade from scratch. How did he made it in bare hand? It's a beautiful model, but I don't think it will be popular (or useful) in mods in such huge size. This is why I am not spotlighting it. That voxel shows why the normal's system the game uses to render works great. Holy crap that's one gigantic voxel model. Amazing graphics and amount of detail. Oh so hypothetical future popularity is now a criterion for spotlight? It's hardly too large for RA2's default scale, after all these are one of the largest trucks in the world. Not to mention how inconsistent RA2's scale is anyway. If the modder deems it too large, (s)he can be scale it down by a simple modification of the voxel bounds. 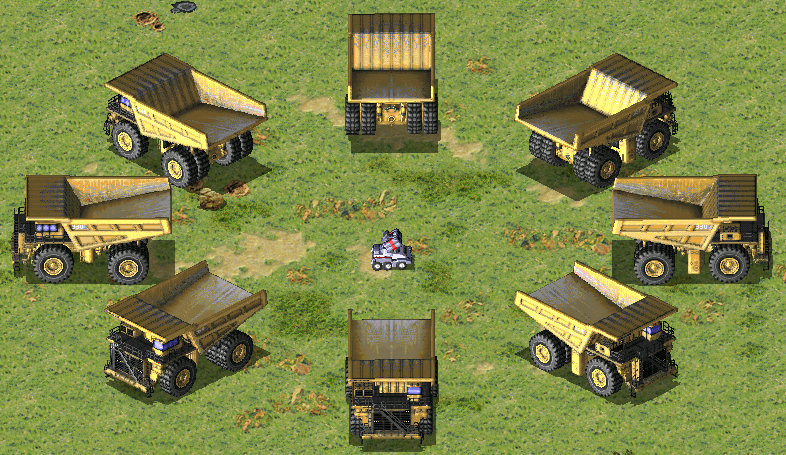 This would also be perfect in OpenRA projects such as ReWire, which have a larger scale than most other mods. OpenRA also allows for individual voxel model scaling in-game. Oh so hypothetical future popularity is now a criterion for spotlight? Honestly, why would we spotlight a voxel that won't be used in mods? Do you think that spotlighting work serves only to boost people's egos? It's hardly too large for RA2's default scale, after all these are one of the largest trucks in the world. Not to mention how inconsistent RA2's scale is anyway. If the modder deems it too large, (s)he can be scale it down by a simple modification of the voxel bounds. This truck is indeed one of the biggest ones I've heard of in my life. And I agree that RA2's scale is messed up by default. But it has reached such scale that it might be weird to see one of those things moving in your game. You'd expect at least the big wheels to rotate and, as voxel, you won't be seeing that. Units of this size works better as SHPs. I also expect spotlighted voxels to be a bit more ready to used than requiring hard customizations. But I agree with you guys when you say that this is a great work of art. If that really is your criterion, you should delete about 90% of the current threads in the Spotlighted voxels subforum. Most of the voxels there are severely outdated and are far from today's standards. No one wants to use subpar voxels from 2005. You'd expect at least the big wheels to rotate and, as voxel, you won't be seeing that. But the wheels do rotate @_@ He used HVA to animate them which works just fine in-game. Once a voxel is spotlighted, it won't loose its spotlight status, unless it was mistakenly spotlighted in first place. In this case, I have no arguments to not spotlight it. In this case, I have no arguments to not spotlight it, am i? Should BAZND make the same quality but with a huge flagship or any vehicle? You should ask B.A.Znd, not me. I think this is better the longer you look at it. Look at the details. And I don't mean only construction details, but it even has dirt and rust as an irregular texture. Just too good.